Hi, I’m John McDougall, and I bought an organic mattress from Gardner Mattress last year for our spare bedroom. With a baby on the way, my wife and I wanted to have a good second mattress for times when we needed to sleep apart. I’m really particular about having natural products when it’s something you’re going to be around a lot or consuming. Sleeping directly on toxic chemicals is not something I like to think about. Kirk from Gardner Mattress explained that if I wanted to try something different than the Talalay mattress I bought from him before, we might also like his organic mattress made from cotton and wool. He said that wool is really breathable and it’s cool in the summer and warm in the winter. Wool is also resistant to dust mites because they can’t live in the microscopic bristles on the wool fibers. The blend of organic cotton and organic wool is really durable and made naturally as opposed to being made in a lab. Wool is also fire resistant, which promotes a safer sleeping environment. Natural products are also sustainable and support farmers, especially when you are talking about organic wool and organic cotton. I love the fact that Gardner Mattress was founded in 1933 and they’re still making mattresses in America. 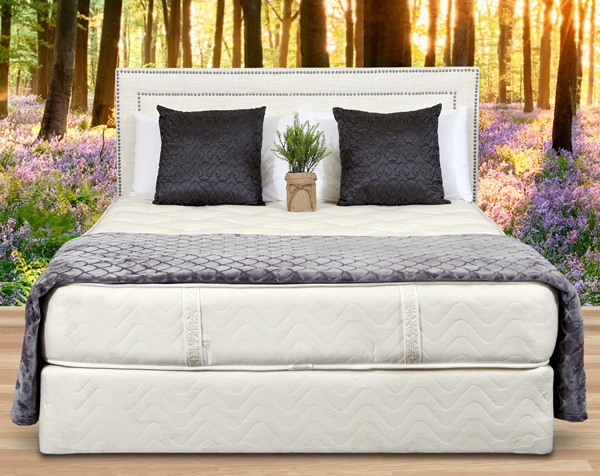 The Ergo organic mattresses is hand tufted and it’s a pocketed coil spring mattress. That means it’s going to last a really long time and give you a great value. The last time I bought an expensive mattress from a big box store, it fell apart very quickly, so I guess most of their research and development dollars go into TV commercials. “Chronicle” on Channel 5 said that Gardner Mattress is “one of the best bedding deals in New England.” Having bought several products from them where I’ve been happy every time, I’d have to agree. Do You Need a Sleep Aid or Just a Better Mattress?